Across the globe, the demand for personal computers (PCs) has declined significantly over the last couple of years, as both consumers and businesses invest in other devices. According to one industry analyst, that historically bleak view may be coming to an end. 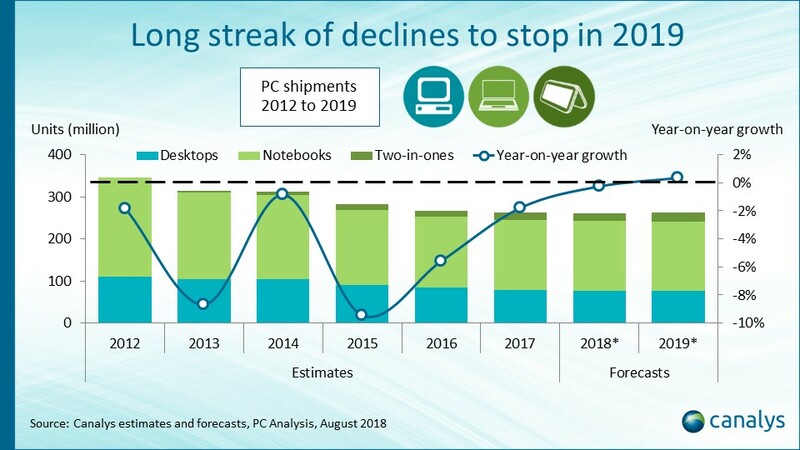 The worldwide PC market will likely experience a slight recovery in 2019, with shipments of desktops, notebooks and two-in-ones set for 0.3 percent growth -- that's after seven years of ongoing declines. The Asia-Pacific (APAC) region will be a key driver as vendors turn to the market in the face of falling demand within Europe and China. PC shipments to APAC will overtake those to Western Europe by 2021. 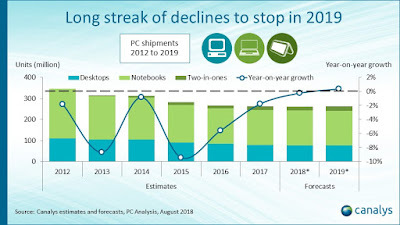 "Microsoft Windows 10 refresh will continue to be the main driver of commercial demand for PCs in 2019," said Alastair Edwards, chief analyst at Canalys. "This will be buoyed by strong economic performance and business spend in the United States, the largest PC market in the world, as well as a continued global push to upgrade on the back of heightened IT security concerns." Furthermore, component supply constraints that have recently plagued the industry could improve. Intel has admitted that tight supply of 14-nanometer processors will delay many x86 PC shipments this year, while DRAM shortages will start to ease toward the end of 2018. According to the Canalys assessment, the PC distribution channel has benefited substantially this year from Windows 10 refresh in the commercial space, both in terms of product sales but also through professional services opportunities around the complex Windows migration process. Canalys believes that this scenario should continue into the first half of 2019. The reality is, however, that this upside potential will not last forever. After some commercial growth this year, maintaining the same level in future will get much harder, particularly toward the end of 2019. The most successful channel partners will focus on generating higher-value revenue streams around PCs, such as application consulting and managed desktop and subscription services for security. This could lead to a potentially more profitable business opportunity for numerous vendors that have suffered many challenges during the PC market decline. A Canalys survey of channel partners highlights some optimism, with 44 percent of APAC-based respondents expecting to see PC shipment growth in 2019, compared with 36 percent of EMEA-based respondents. Asia Pacific will gain importance for the global PC vendors in all categories. The region's developed markets -- such as Australia, New Zealand, Japan and South Korea -- also offer growth in emerging segments such as gaming PCs and affordable Chromebooks. The service industries in the emerging markets of India, Indonesia, Philippines and Thailand will continue to deliver growth for PCs. The start-up culture in these markets has brought small and medium businesses (SMBs) to the fore, with PC vendors offering OPEX-based models that help control costs. Due to the sheer number of such businesses, and their multi-faceted computing requirements -- which range from PCs to servers to cloud computing -- the importance of a capable channel partner cannot be understated.